X3650m3 (8SFF), 2 x 2.66GHz/12M X5650, 24GB (6 x 4GB 2Rx4 PC3-10600R). X3650m3 (8SFF), 2 x 2.66GHz/12M X5650, 12GB (6 x 2GB PC3-10600R). -RAID: Server Raid M5015. Dell Part Number : X3650 M3. HDD Capacity : 8x 300GBSAS. CPU Type : x5675 Hex core. Cpu Speed : 3.0GHZ. Rails: included. (inner outer). CPU Qty : 2. Lid taken off to take picture and its included in case you ask. IBM x3650 2U Rack Mount Server. DVD CD/RW Combo drive. Model-Type 7978W48. IBM x3650 M2 2U Rack Mount Server. 2 x QUAD-CORE XEON E5520 Processors. IBM ServeRAID 46M0851 with battery 43W4342. 8 x 2.5" SAS/SATA Drive bays. 39Y7200 39Y7201. In good condition and in full working order. (MODEL: SYSTEM X3650, MT 7979 A1G. MANUFACTURE: IBM. United Kingdom. COLLECTION IN PERSON NOW AVAILABLE. b) Once an item has been ordered. Warranty what it covers. Northern Ireland, Eire, Scottish Offshore, Scottish Highlands, Channel Islands and Isle of Man. IBM System x3650 M3. Manual IBM System x3650 M3. Southall, UB2 4NJ. Windmill Place, 2-4 Windmill Lane. Unite 4 Ironbridge House. ( Anisa Technologies Ltd ). 2 x Six-Core XEON X5660 2.8GHz Processors. IBM x3650 M3 2U Rack Mount Server. 8 x 2.5" SAS/SATA Drive bays. Model X3650 M2 7947-52G. Manual IBM System x3650 M2. Drive Capacity 0GB. IBM x3650 M3 2U Rack Mount Server. Six-Core XEON X5650 2.66GHz Processor. 8 x 2.5" SAS/SATA Drive bays. 2 x Power supplies. IBM x3650 M3 2U Rack Mount Server. 2 x Six-Core XEON X5650 2.66GHz Processors. 2 x 146GB SAS 10k 2.5" hot plug drives. 8 x 2.5" SAS/SATA Drive bays. This is forone of the two IBM x3560 M2 2U Rack servers This one has a bad IMM although it dose pass the self health check, the bios is not able to reset it and it never asks for an IP on the network. Removed from site fully working! All drives have been securely wiped so NO OS is supplied with this machine. 4 x 300GB Hard Drives 32GB Ram Xeon E5-2620v2 6C 7915E6G 7915C3G ZG13-0265 September 11, 2013 Rather heavy Hence collection... But courier can be arranged! CPU Type : x5680 Hex core. Dell Part Number : X3650 M3,7945-AC1. Rails: included. (inner outer). Cpu Speed : 3.3GHZ. CPU Qty : 2. Lid taken off to take picture and its included in case you ask. However we may use our discretion also to provide the safest and best service. IBM System x3650 M4 7915-G5G. Model No: System x3650 M4. 1 xIBM System x3650 M4 7915-G5G 2U Server. Storage: 3 x 300GB 2.5" 15K SAS 6Gb/s Hard Drive HDD - 81Y9671 (8 x 2.5" SAS Bays Total). RAID: 1 x IBM ServeRAID M5100 Series 1GB Cache Battery. Processor - 2x Xeon Six Core X5660 2.80GHz. RAID Cards - Yes, Included (49Y4737). IBM System x3650 M2. IBM System X3650 M3. IBM System x3650 M3. Dell HP IBM Workstations. Dell HP IBM Servers. IBM System X range. IBM System x3550 M2. Rapid Rails. IBM X3650 M3 2U Rack Mount Server. 3 x 4GB PC3L-10600R 1RX4 49Y1424 (12GB Total). Processor - 2x Xeon Six Core X5670 2.93GHz. IBM System x3650 M3 2U Rack server. 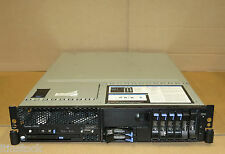 1 x IIBM System x3650 M3 7945-CTO 2 x Xeon Six Core X5660 2.80GHz 32GB RAID Server. RAID Card - Yes, IBM SAS9220-8i. M5015 RAID CARD - 46M0851. IBM X3650 M3 2x X5650 2.66GHz Quad Core 48GB of RAM 4x 72GB HDD. Model: X3650 M3. CPU: X5650 x 2, 2.66GHz, Hex core CPU. Storage: 4 x 72GB 2.5" HDD. 2x 146GB HDD. Collection Only From Battersea, London, SW8. 4x LAN Port. 18 x 8GB PC3-10600R 2RX4 49Y1446 (144GB Total). IBM X3650 M3 2U Rack Mount Server. 2 x Six-Core XEON X5650 2.66GHz processors. 8 x 2.5" SAS/SATA Empty Drive Bays. 2x 90Y8873 600GB 10K 2.5” SAS. 2x E5-2630 v2 6C 2.6GHz 15MB 1600MHz 80W. HDD Capacity 16 x 2.5" SAS HDDs (No Caddies Included). All hard drives are fully tested by performing a HMG Infosec Level 5 wipe on them. Everything is fully tested unless otherwise stated. NEW IBM System x3650 M4 7915-E5G. Model No: System x3650 M4. 1 xIBM System x3650 M4 7915-E5G 2U Server. Storage: 4 x 300GB 2.5" 10K SAS 6Gb/s Hard Drive HDD - 90Y8878 / 8 x 2.5" SAS Bays Total. IBM x3650 M2 2U Rack Mount Server. 2.5" SAS Hard Drive bays. DVD-RW Drive. 2x 6-CORE X5670 2.93GHz. IBM System x3650 M2. IBM System X3650 M3. IBM System x3650 M3. Dell HP IBM Workstations. Dell HP IBM Servers. IBM System X range. IBM System x3550 M2. IBM System x3650 M3 Rack Server. Tested with VMWARE ESXI 6.0 /6.5 / Windows Server 2016 64x. Backplane: 1 x 4Bay 2.5" SAS / SATA ( 2 x4way 2.5" SAS / SATA Option available) . Model X3650 M2 7947-52G. Manual IBM System x3650 M2. Dealz4TechUK is an independent distributor of computer hardware products for over a decade. If we do not have a part that you need we most likely would be able to source since we do specialize in end of life, hard to find and obsolete hardware. IBM x3650 M2 2U Rack Mount Server. IBM Dual Port Gigabit Ethernet Daughter card. IBM System x3650 M2. IBM System X3650 M3. IBM System x3650 M3. Dell HP IBM Workstations. Dell HP IBM Servers. IBM System X range. IBM System x3550 M2. Network NIC.